I promise that if you love cheesecake this will be the last homemade cheesecake recipe you will ever search for. It’s the ultimate creamy cherry cheesecake that everyone will be talking about at your next dinner party. Don’t let the decadent cheesecake scare you away from making it homemade because it didn’t scare me. I watch the food network, family members in the kitchen, read recipes and make mistakes and that’s how I learn to cook and bake. You only fear what you think you can’t do, so try it. Making a cheesecake is very simple to do but like anything takes time and by trial and error you will find what works best for you like I have over the years. Cheesecake has long been a favorite in many homes around the world and if you don’t make homemade cheesecake you know that if you were to go to a bakery you will be paying quite a bit of money for a simple cheesecake. I believe the last cherry cheesecake that I purchased was with my best friend since he’s a big fan of cherry cheesecake (nope he’s not just a fan he’s a fanatic) cost $15.99 for a very small homemade in-store cherry cheesecake (which he ate almost the entire cake). I let him go for it because there’s nothing better than seeing someone enjoy food as much as the expressions on their face. I lost count how many times I heard him say, mmm. Probably another reason why I enjoy cooking and baking so much just for that reaction. Mind you the cake was very decadent as it was bought at a high-end store in town that only uses the best ingredients and always has decadent treats on hand. Sure, in the moment when we wanted the cherry cheesecake but I knew I could make an even better cherry cheesecake for him so today this is what I’ve done. I’ve created this cheesecake using ingredients that I thought would beat the traditional cherry cheesecake in the creaminess department with the availability of products we have today. The best part about this simple cheesecake recipe is that if you are not a fan of cherries, you don’t need to use cherries. If you fancy blueberries make a blueberry cheesecake or strawberry cheesecake, chocolate cheesecake or a peach cheesecake whatever floats your boat. The base of this cheesecake is plain with a hint of citrus along with the crust so the toppings are endless. You could easily leave no topping on the cheesecake and have a buffet of toppings for your guests to choose from which might even make this dessert much more fun to eat. You can easily make your own cherry sauce for cheesecake if you have cherries readily available like I did back in the summer time when I made my cherry ricotta turnovers. The process to make the cherry sauce is so simple you won’t be buying it in the can in the off-season if you tend to use it quite a bit or maybe you can look into canning cherry sauce so you always have it in your pantry. We don’t use cherry sauce enough to warrant canning it but it may be an option for you. I was going to opt in and make a simple no-bake cherry cheesecake but then I wasn’t sure if it was going to have all of the same flavours that I was used to growing up. I’ll be honest and say that cherry cheesecake is not one of my favourite treats although my wife, like my best friend loves cheesecake. 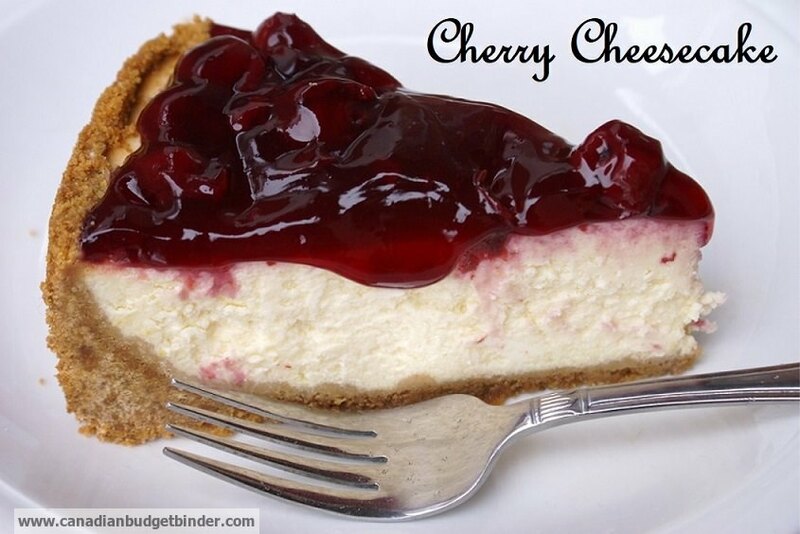 Her memories of cherry cheesecake date back into the early 80’s when her mother used to make cherry cheesecake quite often in their house as an easy after dinner treat. She vividly remembers the cherry cheesecake not being made in a spring form pan like I am doing today rather in a glass rectangular dish. Digging a spoon in the dish when no one was looking and shoving that piece of cherry heaven in her mouth was something she’d never forget. Other times her mother would make it in a pie dish which resembled a cherry cheesecake pie. The taste of the Philadelphia cream cheese was so tangy in her mouth mixed with the cheesecake crumb crust and cherries it was difficult to stop eating. One of the most important parts of the cherry cheesecake she says is the crust. She didn’t want to skimp out on the crust so it has to be thick and flavourful which was more than accomplished with this recipe today. “There’s something about having a thick crust with the cheesecake filling and the hint of cherry flavour that brings the cheesecake all together in your mouth”, she says. I will have to agree with her on this one because without the thicker graham cracker cheesecake crust this would have tasted more like a slice of cheesecake filling. Some people may enjoy that but for this cheesecake I made sure that the crust is not only on the bottom of the cherry cheesecake but also all around the sides of the cheesecake. Now, this cheesecake is huge as it’s made in a 10 inch spring form pan so with there only being the two of us here it took us a while to get through the cheesecake. We didn’t waste any time busting into the cheesecake after it was done and cooled down but what we both noticed and I’ve noticed with other cheesecakes I’ve made is that if you let the cheesecake rest for a couple of days it would be at its optimal time to eat it. You can easily make this a couple of days in advance if you have a party to go to or want to serve it at your own dinner party. 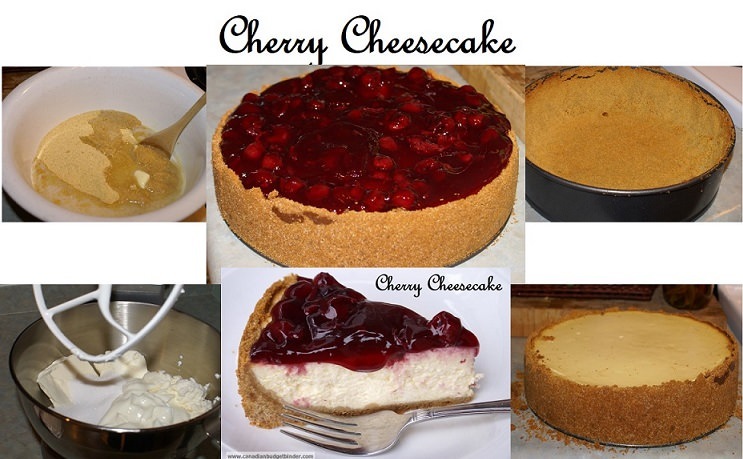 In fact, I suggest you make it in advance to get the best tasting cherry cheesecake you will ever put in your mouth. The flavours in this cheesecake are so delicate and creamy you will be shocked to find out I used ricotta and Greek Yogurt in the mix. This is a homemade cherry cheesecake made with not only cream cheese but ricotta cheese and Greek Yogurt. Cherry Topping: See link for homemade cherry pie filling at end of this post. You will need 2-3 cups of filling depending on how much you'd like. You can also add any other topping you'd like if you aren't a fan of cherries. In a bowl add all of the graham cracker crumbs, sugar and melted butter and mix until combined. You should a wet crumb that you can easily press into your sprayed 10 inch spring form pan evenly at the bottom and all around the sides. If the crumbs are not wet enough they will not stick so you may need to add a bit more butter. Once you have the crumbs pressed into the spring form pan bake the crust for about 10 minutes until golden brown. Don't over bake your crust, set a timer. Set the crust aside to cool while you are making the cheesecake filling. In your mixer add your sugar, cream cheese, ricotta and Greek yogurt and mix until blended. Place the spring form pan into the pre-heated oven and bake for about one hour or until the cheesecake is firm but still a bit wobbly. I test the centre by putting in a toothpick to see if it comes out clean but also set a timer. Once out of the oven let the cheesecake cool then add your topping over the top of the cheesecake. Serve at room temperature but making it a day or two in advance will help all of the flavours come together. Keep refrigerated for up to one week. Cherry Topping: If you want to make homemade cherry topping like I did here is my recipe for Cherry Pie Filling or use a can of Cherry Pie Filling from your local grocery store. I hope you enjoy this cherry cheesecake as much as we do and I’m pretty sure that if my best friend reads this recipe today in full that I’d best be going home with one next time I go to visit him. Don’t worry, I’m always thinking ahead. Don’t forget to Subscribe to the blog so you get my daily email. Are skilled trades the better choice for Canadians? 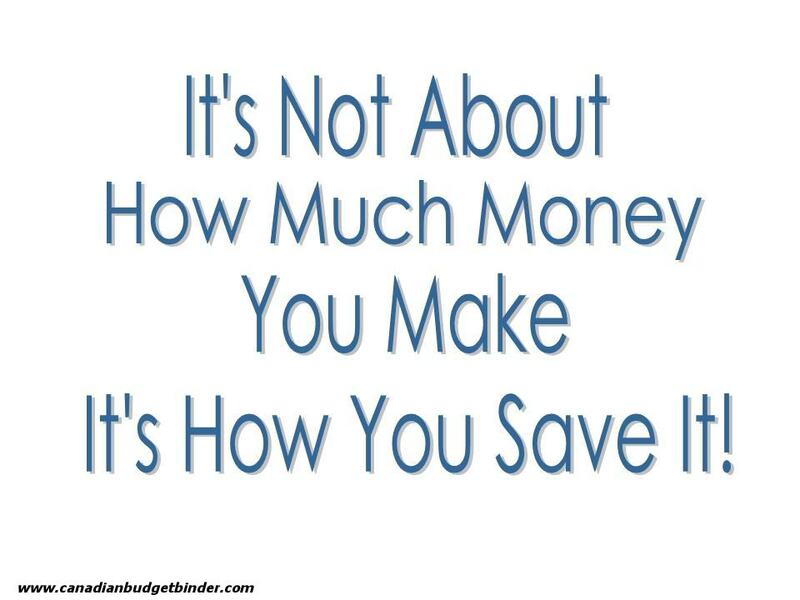 It’s so easy and what cost you near what you would pay to buy it at the bakery. Looks yummy, though probably too much yummy for a chubby young fellow like me. Certainly no harm in trying it once, though, is there?? Oh it’s worth trying… I tried every slice in this cheesecake lol. Hehe. Got to make sure the cake is tasty, and the only way to do that is to chomp it all! Nom. Can’t wait to try this! I tried cheesecake once, years ago, it was a total flop and I haven’t tried since as I’ve always heard it’s very hard to make. This version sounds doable, though. You just can’t beat homemade! I usually make a no bake version from a recipe I got from my younger SIL years ago and hubby loves it! It’s supposed to be made in a flan shell but I use a graham cracker pie shell. This look s like something hubby would love!! 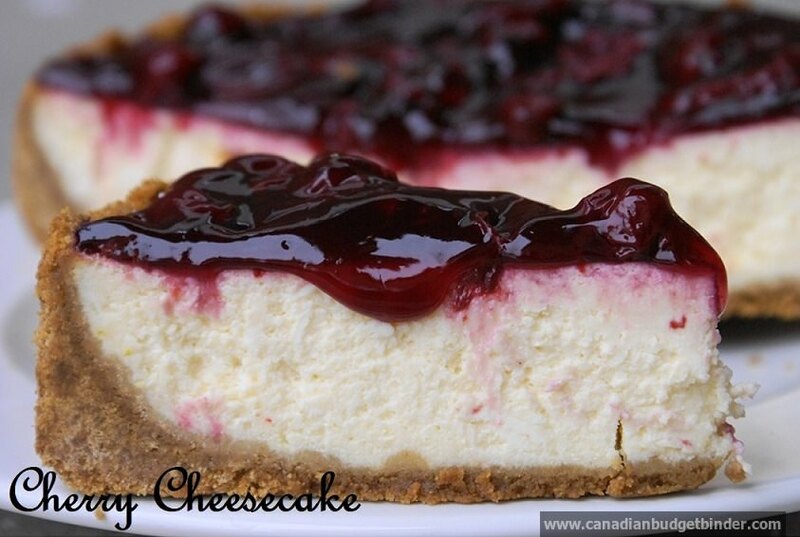 I might try making it for the next family gathering as everyone loves cheesecake!!! I have a spring form pan, but I’m not sure if it is big enough. Guess I’ll have to check…. I have some cherries in the freezer I bought for baking, I buy a pail of them when they are in season every couple of years. Nice for the quick fruit crisp when a craving hits…. Sure hope somebody has cream cheese on sale soon!!!!!! Ya I know it can be tough to stick to your guns but you sound like you are on a roll.. good luck. Mmmmm yummy defo be trying this one out as I don’t usually do baked cheesecake I do the no bake version! Sounds like quite a few people do the no-bake version.. give this one a go mate you’ll love it.